When the 2nd UN Arab Human Development Report was released last year, I discovered some sobering facts regarding literacy in Arab states. With statistics like 65 million illiterate people in a region composed of 22 countries or “the total number of books translated into Arabic during the 1,000 years since the age of Caliph Al-Ma’moun [a ninth-century Arab ruler who was a patron of cultural interaction between Arab, Persian, and Greek scholars] to this day is less than those translated in Spain in one year,” it’s hard not to become discouraged about the state of literacy around the globe. Largely considered to be a cornerstone to political and economic development, the ability to read and write is essential—as well as the exposure to literature. With heartbreaking statistics like those published by the Arab Human Development Report, it’s exciting when good news regarding literacy and exposure to literature arises. Although it is not in the Arab world, India is a key player in the world political and economic scene, and as a developing country, literacy has been on the forefront of social and cultural development initiatives. In 1947 at the end of British rule, a mere 12% of Indians were literate. The number has risen in recent years to 66% (in 2007), showing a record 12.63% increase in the 1991-2001 decade. Looking at the numbers, of course, this still leaves the country with a 34% illiteracy rate—14% more than the AHDR statistic for the Arab world and well below the 84% world average literacy rate. Additionally, a large gender gap appears in the rates (something which wasn’t discussed in the AHDR). This past year in 2009, the literacy rate for women was 54.5% as opposed to 76.9% for men. That gap, thankfully is closing with a 14.38% increase in women in the 1991-2001 period (during the same time, literacy in men increased by only 11.13%). So what about these statistics is positive? India, along with the Arab states, is well below the UNESCO literacy threshold of 75%, and although literacy is increasing, and has increased exponentially since independence, the nation still has a long road to travel before it achieves any substantial literacy goal. But there is a bright side—unlike in the Arab states, literature is accessible (or relatively so, depending on region) in India. 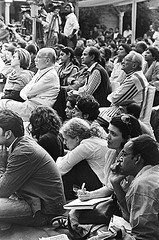 First organized in 2005 by William Dalrymple and Namita Gokhale, the festival serves as a way to unite the Indian people with “Indian literary luminaries” who now live outside of the country (think Salman Rushdie, Vikram Seth) as well as a way to “showcase lesser-known authors writing in Hindi, Tamil, Bengali and other regional Indian languages.” Above all, however, both festival organizers aim to bring together India’s diverse artistic and literary traditions—which in a country as vast and linguistically, religiously, and economically as diverse as India is no small feat. This year, the expected 30,000 festival attendees is testament to Dalrymple and Gokhale’s hard work. In addition to literature, music, film, theater, and food play a large role in the festival, and publishing houses from all over the world have books in English, Hindi, and various other dialects for sale. With some authors being viewed as literary superstars, chased down by adoring fans, it can seem strange that in such a short time India has risen to become a major world literary player. What used to be found only in university circles is now pop culture, and “especially in the past five years, a booming economy has created big audiences for books, including genres like literary fiction, young women’s literature and children’s books, which were tiny niches earlier. Book sales here are increasing at about 5 percent a year, according to PricewaterhouseCoopers.” If nothing else, this is exciting news—the access to a wide array of literature is definitely a good thing for a nation state with abysmal literacy levels. What looks like a booming industry and culture is a booming industry and culture. However, it has just begun. With the growing economy and access to literature, literacy is soon to follow; with free cultural megolitical events like the Jaipur Literature Festival, literature is accessible to all, regardless of class or economic status. In the upcoming world literacy census we’ll hopefully find some more hopeful figures and trends, something that shows a new direction for cultures everywhere.